OK, I'll admit it, it's been very difficult for me to write for several years now and I've not produced much of late... But, sometimes, not "making deadline" can be a good thing! 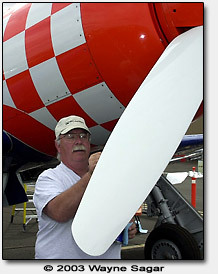 When I spoke with Furias owner Bill Rogers at RENO 2006, his racing juices were flowing and he was optimistic that he might return the airplane to RENO for 2007. Then at the 2007 Arlington, WA, EAA fly-in, Rogers was much less optimistic, and a firmly spoken two words "we're done" pretty much squashed any optimism that he might yet bring the airplane back. In Air Racing, though, there is always hope and after seeing pictures provided by Bill recently of the airplane essentially back together again... I again asked the question and received the same, firm answer. "We're done". As I was outlining the article, Bill had sent me a couple shots of the airplane, nearing completion after the installation of a rear seat. I'd hoped against hope that this was a positive sign and emailed him the question once again... and received the "We're done" answer written in the above paragraph. well, I figured that pretty much put an end to any hope we'd see the airplane at RENO, at least, under the ownership of the great competitor Bill Rogers.. I just got off the phone with Bill and, well.. I think the old saying "never say never" might just apply... 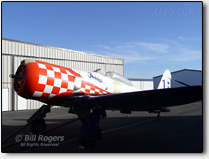 Though Bill has made the decision that he can no longer support a long term racing program for Furias and does have it listed for sale, he is making both a "fun" decision and a practical one, in that there is no better venue to show a raceplane for sale than at RENO itself! 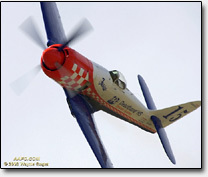 Though Bill tells me that he has yet to secure finances and a pilot, he has the airplane on the entry list and does intend to bring it to RENO to compete this year! 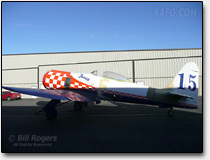 Rogers had initially felt that the addition of a second seat to the airplane might make it more attractive to potential sponsors... Somewhere between the starting and finishing of that second seat project, he had to take a serious look at his working life, and with retirement looming on the horizon, the extremely difficult decision to throw in the racing towel and sell the airplane was made. Now that the seat project is done, and the airplane is Race Ready, I asked how it turned out. Bill Rogers is a detail guy and as expected, the second seat installation sounds like the bomb! Bill told me that he sat in several of the current second seat airplanes and found that the most comfortable seating was that of the Sanders' Argonaut. However, Bill thought the 12" canopy extension on the Sanders install was not enough. "What we have is the Argonaut back seat with Stewart Dawson's 18" canopy extension". I asked Bill if a pilot choice had been made and he said he had a "list" and joked, "Pilot wanted, bring money"! Will we see FURIAS turn the sticks? Will Bill's friend Skip Holm fly her? If yes to either, what does this bring to the mix for 2008?? Having two "Buick" class airplanes flown by expert pilots in the mix of the Gold field? We'll leave the possibilities for you to discuss! Meet us in the Hangar and tell us what you think! Discuss this story at the HANGAR!